With VoIP (Voice Over Internet Protocol) technology, you will benefit from greater functionality and flexibility than with a traditional phone system, at a significantly lower cost. As Cloud based telephony will be part of your IT network, with Impact Computing you can enjoy the added convenience of one stop support for both your IT and telephony needs! Only a minimal initial outlay is required to cover the purchase of the handsets and the installation, making VoIP suitable regardless of your business size. The quality, easy to use system is reliable, calls are crystal clear in real time and a host of useful call management features are included as standard. To re-assure you, Impact Computing successfully utilises VoIP. 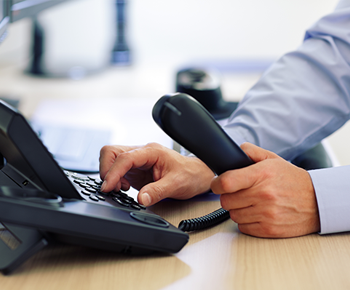 Our phone system is vital to our business and critical to our reputation and the reliability, quality and functionality of our VoIP system has exceeded our high expectations! Why Switch To A Hosted VoIP Phone System? Call management features - including speed dial, direct dial, call transfer, call recording, department menu system, voicemail & call queuing. On-demand service with minimal upfront costs - new users can be easily added & payment is on a per handset basis. Lower call costs - cheaper call rates, inclusive minutes, free site-to-site calls & low cost international calls! Flexible working - system facilitates flexible working, including hot-desking & home working. Number choice - flexibility to retain your existing numbers or set up new ones. Business continuity - a Cloud based service reduces the risk of business disruption due to natural disaster. Future proof - as the Internet becomes an ever more integral part of life. Why Choose Impact Computing For Your VoIP Phone System? One stop support - an Internet based phone system will be part of your IT network. Easy transfer - VoIP is quick to install & your numbers will be transferred with no downtime. Satisfied clients - a number of clients are already enjoying the benefits of VoIP!